Roadways get us where we need to go. America’s highway system especially is a sprawling, glorious bundle of pilgrimage and trade routes, used by millions constantly, all day, every day of the week. The average American spends nearly 40 hours commuting in a year, and that’s doesn’t even include the time you spend doing irregular errands/traveling. We spend a seizable amount of time on the roadway, but obviously people who have made a career of driving, such as truckers and bus drivers, spend a great deal more, on those very same roadways. The average truck or bus is about 20-30% larger than the average car, and takes about 30-40% more time and space to stop. Each year, over 3,000 people are killed and over 104,000 people are injured in road accidents involving trucks, or generally vehicles weighing over 10,000 lbs. Meanwhile about 330,000 trucks are involved in road accidents. The above numbers are getting higher; research shows trucking accidents have been increasing in the past few years, thus so are fatalities. There has been a 5% increase in the number of trucking accident related deaths of non truck drivers, and a 9% increase in the deaths among truck drivers. Those third party bystanders and pedestrian deaths meanwhile increased by 11%. What does this mean for the average driver? When a car and a truck collide, the truck driver is by no means safe, but he or she is certainly much better off than the driver of the personal car. Out of all of those aforementioned accidents a year, 70% of the victims who suffered minor or major injuries were people in small cars, while 24% were truck drivers. The remaining 3 percent were bystanders, meaning pedestrians or cyclists in the vicinity who were caught up in the crash. Commercial trucks account for 4% of the vehicles on the road and are responsible for 9% of the number of miles traveled on America’s Roadway each year. Seventy-eight of those accidents occurred during weekdays, 72% of which were between the hours of 6 a.m. and 6 p.m. Families, professionals commuting to work, school buses, these are among the parties that take to the road during these hours. When trucks on the road during these times do crash, they are far more likely to be involved in a multiple vehicle accident, whether or not they were the cause of the accident. When trucks are involved in fatal accidents, 81% of the time the fatalities occur within accidents with multiple vehicles, as opposed to personal cars, whose fatalities occur within accidents with multiple vehicles only 58% of the time. This isn’t to say that trucks are at fault, or that truck drivers are worse drivers than personal passenger vehicles. In truth, personal passenger vehicle drivers involved in fatal crashes were more likely to have had a revoked or suspended license (14% of the time) as opposed to truck drivers (8% of the time). It just means the addition of the heavy freight, the truck, and the design of the truck makes them more dangerous on the road than smaller passenger cars. Of the fatal two vehicle accidents recorded, trucks happened to be more than 3 times more likely to be rear ended than non truck vehicles, even though following too closely is illegal in most states. If you are involved in a trucking accident, the answer to the question of who is held liable is far more complex than it would be in a non trucking car accident. For this reason, before you begin formally taking legal action after a trucking accident, you may want to consult with an attorney experienced in accidents involving trucks. It’s important to understand what federal and state law and regulations come into play, or what standards both vehicles were supposed to meet at the time of the crash, before you can determine who is likely to be held liable. Not consulting with an attorney and getting involved in a lawsuit you can’t win could be disastrous; often trying to hold someone liable for your accident will take thousands of dollars in attorney and court fees, and will simply eat up your time. It’s best to advance when you know the process will be worth it. Additionally, you will have to go through the process of determining who is responsible. Was it the driver, and poor driving that caused the accident? Was it a malfunction on the part of the manufacturer of the truck? Was the owner of the truck forcing his or her employees to abide by dangerous practices such as using a cell phone to check in while they drove their vehicle? The list of possible responsible parties is unpredictably long, and narrowing it down requires careful study and review of the facts of the accident. You may also wish to sue the trucking company over the driver, as the company will more likely be better able to financially support you after the accident. You should know that you’ll have to find compelling reasons for their fault over the driver’s; they’ll often counter that they only contract the driver out, and thus aren’t responsible for driver error, or even if the driver is a full employee, the company will refuse to take responsibility for that employee, saying his or her poor driving was not their fault. Sometimes, for example if the company name or placard is displayed on the truck, it doesn’t matter if the driver was a full employee or not, the company will still be held liable, but accidents don’t always work out this way. Trucking accidents aren’t uncommon, are often deadly, and they can very deeply change your life if you get into an accident, or a loved one of yours is involved in an accident. However, like all matters you may choose to sue over, it’s important to review your options and make a decision that won’t cause you further harm. A lawsuit that drags on may be just as damaging as the accident itself. You should contact an experienced attorney first. 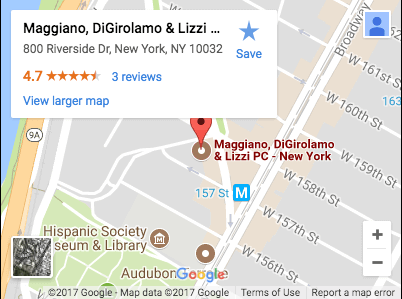 Maggiano, DiGirolamo & Lizzi, P.C. New Jersey’s Trucking Accident Law Firm. Experienced and knowledge that continues to help the injured victims get compensation, and protecting the right of their clients. Contact our law office, we can help you determine if you have a case, give you all the options available to you. We are here every step of the way.